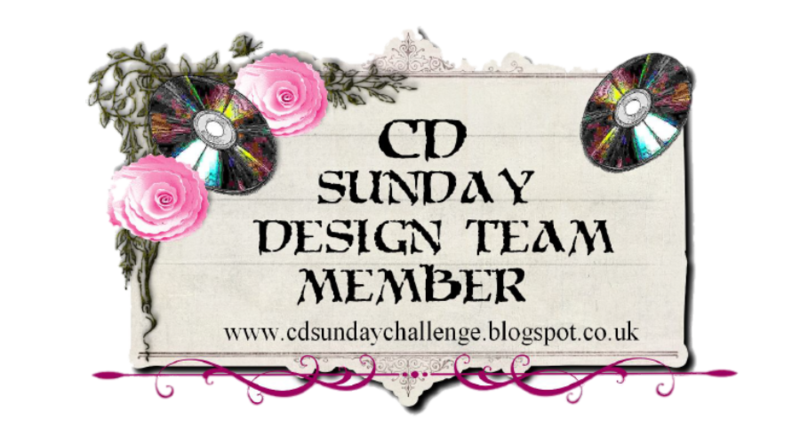 For the next two weeks the CD Sunday Design Team are celebrating the 9th birthday of the Challenge! The theme is one that we all make cards for – Birthday! We’ve all contributed to the prize money and the lucky winners will be able to name which craft retailer they want to receive a gift voucher for. 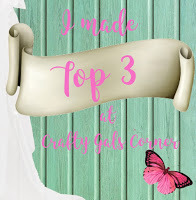 I’m sure everyone has a wish list for something from their favourite craft store so now’s your chance to possibly make that longed for item your own! As they say, ‘you have to be in it to win it!’. I’ve made a very simple card using dies I bought before Christmas. The oval scene die is by Pretty Quick and is just called Puffin. The other die is a set of dies and stamps by Apple Blossom called Puffin Dies and Stamps. There’s a stamp to do the facial features and I masked off parts to get the different colours. I used Tonic Hybrid inks in Black Shadow and Carrot Stick. The backing paper is my item from a craft CD. 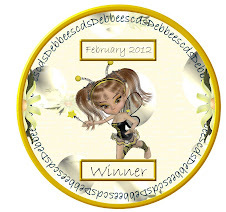 I used Craft Artist to design it and used Craft Scape digi kits – Seaside and Country Garden. On 29th April my darling husband would have been 60 and he loved puffins. So as soon as I saw these dies I bought them in readiness for his birthday. Sadly he didn’t live to see his birthday and passed away in February. I was watching a TV program recently about wildlife and there was a piece about puffins. They live at sea and only come back to land to breed. They return to the exact burrow every year and wait for their lifelong mate to join them. Inevitably some don’t make it back and it was so sad to see their mate standing outside the burrow waiting for them - they looked so confused. As they pair up for life if one dies they never look for another mate. Don't forget to add some thing to your card that has been printed from a craft CD. The theme at The CD Sunday Challenge this fortnight is ‘Blue and White, chosen by Margaret. I used a backing paper from Joanna Sheen’s Oriental Dreams CD but I opened it in My Craft Studio and changed the colour and transparency. The stitch design is one I bought from www.stitchingcards.com. It’s supposed to be worked in several colours but I wanted a sort of Willow Pattern look so did mine in all blue. I cut away the corners from the white card using corner scissors and backed it with blue card. I copied the leaf designs from the tree and stitched them in each corner. I finished the card by adding glittery peel offs around the edges. Don't forget that the CD Sunday Challenge is about making items using something printed from a craft CD Rom. You can use other craft items on your card/project, such as a stamp or die, but you must include something from a craft Cd. 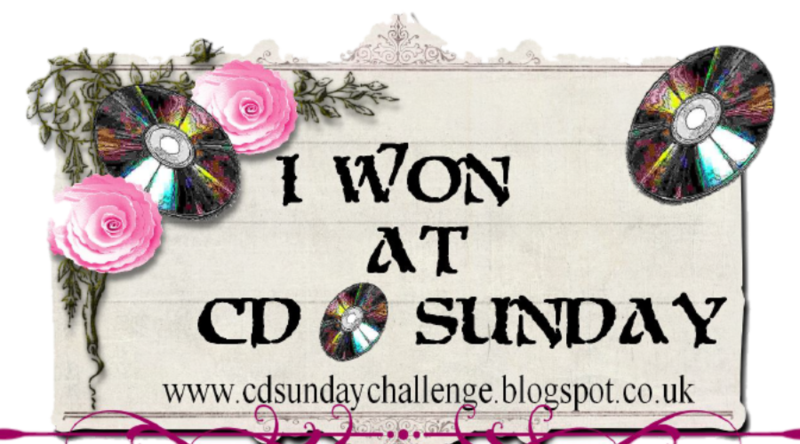 So if you like colouring stamped images or digis you can still enter the challenge but you must include something from a CD such as a backing paper, a sentiment or a butterfly for example. 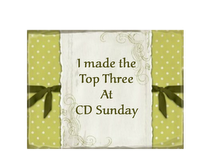 In your blog post/Facebook entry you must give the name of the CD you've used. This is important if the items you've used can be bought as a download as well as a CD as the Design team can't tell which has been used unless you tell us. Your entry can't be considered for a prize if you haven't used a CD or if you haven't told us the name of the CD in your post. The Design team still leave comments on your blog but there's no chance of winning if the above hasn't been followed. 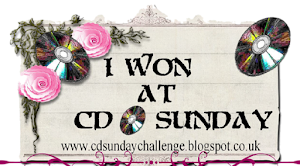 We now have a Facebook page if you don't have a blog - The CD Sunday Challenge. Wynn has chosen 'Winter Wonderland' as the theme at The CD Sunday Challenge. I decided to use a card blank design from the Joanna Sheen magazine box kit issue 6 and also use an image that was in the paper pack that came in the kit. I used some pale blue card from my stash for the base layer and topped that with a really pretty bird design backing paper from a My Craft Studio CD – The Best Of MCS Christmas. The CD was free with Quick Cards magazine back in 2012. The ‘Let It Snow’ was also in the free paper pack. This fortnight Meg has chosen the theme of Christmas at CD Sunday. I need to start making my Christmas cards, so this was a perfect theme for me. I expect everyone else is well ahead with their cards but if not then why not use something from a CD Rom and join in with the challenge either via the blog or the Facebook page. I’ve been chomping at the bit to use some Christmas dies from Creative Crafting World so that was my starting point for this card. I used red mirror card to cut the main backing mat die then cut the poinsettia doily die twice from red and green mirror card, keeping all the ‘bits’ that were cut out of the green layer. I used a plain circle die from another Creative Crafting World die set to cut out the middle of the red doily as well as cutting away all the outer ‘leaves’ with a scissors. By placing the two doilies one on top of the other it showed the green layer underneath. I then replaced the green ‘bits’ into the poinsettia so it looked like the leaves were behind the red petals. I finished off the poinsettias by adding gold gems to the centres. I then added a circular topper to the middle which is also from Creative Crafting World. My card blank was an 8 by 8 which I covered with a backing paper from a Debbie Moore Designs CD. All the red bows were painted with a clear Sparkle pen to add a touch of shimmer. The die cuts were then added to the card but I felt it needed something more so cut a poinsettia from the same mirror card and added some green gems to the other three corners. When it comes to anything crafty I’m a terrible hoarder – if I think I can use it in my crafting it gets kept. I also LOVE Christmas so it’s no surprise that I hoard all sorts of things Christmas related! So when Carol chose ‘Off The Cutting Room Floor’ as the theme at CDSunday I decided to have a rummage through my Christmas craft stash (which fills up a small wardrobe!). I came across these half-used Christmas papers from various CDs and decided to try and make a card with them. I must have kept them for years as most of them are printed onto photo paper and I haven’t used that for a long time. It didn’t go quite to plan!!! Originally I thought I’d use several papers, rolling them up to make a tube and cutting them into different lengths. Then arranging them in size order to make a triangular Christmas tree shape. I gave up on that idea as the colours didn’t work well together. I then decided to use an embossing folder and then highlight the raised areas with Embellishment Mousse. It looked OK but I went over the edges of most of the images and it looked a right mess. So then I embossed a second piece, cut the trees and snowflakes out, rubbed the mousse over them and glued them on the first piece. I then put gems and stars over all the remaining raised areas and managed to hide the messy mousse bits! So something that should have been a simple quick make took me quite a while – Hey Ho! Embossing folder by Crafts-Too called Let It Snow Frame. Red backing paper from an Artylicious CD by Glenda Waterworth called Season’s Greetings. It was made in 2007 so quite an old CD. Tonic Nuvo Embellishment Mousse called Cosmic Brown. Green backing paper by Hunkydory from a magazine prize. The sentiment is a Paper Boutique die by Creative Crafting World from set 10. I thought it was about time that I joined the 21st century and got myself a Blog! This should be fun! I'm in my fifties, married with no kids out of choice. I started making cards on 1st January 2005 and really enjoy it - although I wish there were more hours in the day so that I can try out more techniques. Hope you enjoy it here and leave lots of comments. Happy Days! Guest Designer in November 2011 and March 2012. Joint Second - 1 November 2015. Something beginning with H Theme. Third - 21 September 2014. Male birthday card Theme. Third - 07 September 2014. Happily Ever After Theme. Second - 10 August 2014. Quilted Fun Theme. Second - 17 November 2013. Simply Square Theme. First - 22 September 2013. Snow People Theme.